Moto Guzzi has been a leading make in Italy since 1921 and it is one of the few Italian makes to become well-known abroad. 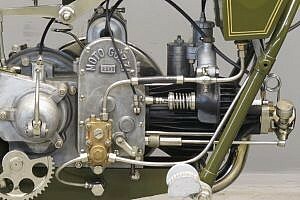 From the twenties on a number of interesting racing machines with OHC engines were developed and Guzzis became a force to reckon with in TT races. In the 1926 lightweight TT Ghersi was credited with the fastest lap and he actually was disqualified from the second place because the spark plug he used in the race was of a different make as the one he used in the practice session. 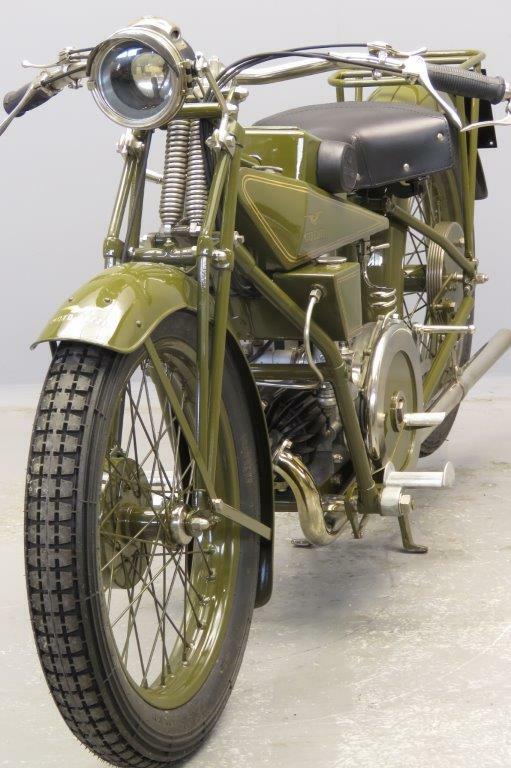 In1935 Stanley Woods won the Lightweight TT with a spring frame single Moto Guzzi; the next day Woods won the Senior race on a Guzzi twin! 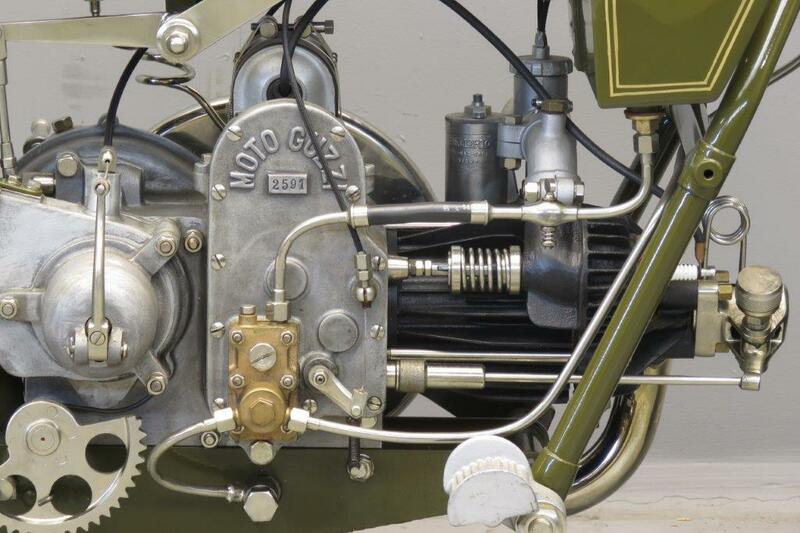 The design of the Sport 13 engine goes back to the early twenties. 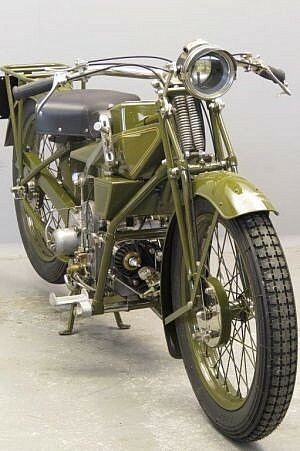 It replaced the “Normale” type and from 1923 till 1928 the Sport was the only production Guzzi in the range. 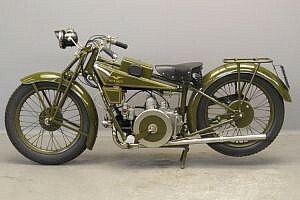 It was finished in green with gold pin striping up to including 1927, after that the colour changed to red. The Sport has a remarkable engine with its horizontal cylinder, radial finning to enhance cooling and big but slender exposed flywheel; the idea behind this construction being to keep the engine’s main bearings close together. 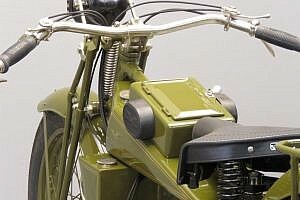 The machine’s frame with widely splayed and braced front down tubes is very rigid and the low, horizontal position of the engine and gearbox ensure good road holding and handling. 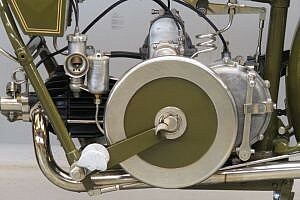 Bore x stroke are 82 x 88 mm and the engine delivers 13 hp@ 3800 rpm. The Sport 13 weighs 130 kg, has a top speed of about 100 km/h and a petrol consumption of 3.4 litres per 100 km. Total production between 1923 and 1927 was 4107 machines. 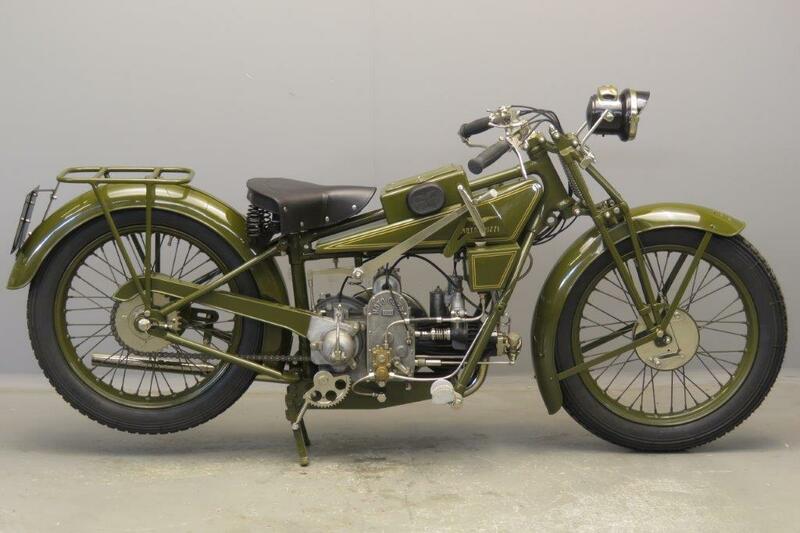 This well-restored example is fitted with a Dell’Orto carburettor and comes complete with Bosch ignition and a Lucas acetylene lamp.